Yesterday was a pretty bad bay for Venezuelan private airlines. First, the Supreme Court ruled that the common – if obnoxious – business practice of “overbooking” is illegal. The judicial case didn’t involve any local company but Spanish flag carrier Iberia. The head of the national airline association said that overbooking was considered legal in Venezuela through a old government resolution and they will respond shortly. A short time later, the Consumer Protection Agency (INDEPABIS) announced that several airlines have been severely fined during the “Safe Vacations for the Good Life 2012” control plan in Maiquetia International Airport. No further details of the fine were given, but Indepabis is carrying inspections on airports and bus stations. The overall civil aviation sector is still in a deep crisis. 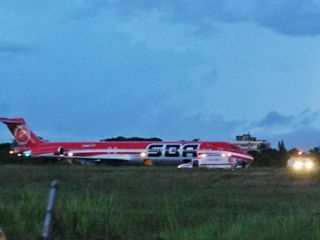 This week, an Aserca Airlines aircraft (using SBA Airlines livery, as part of their “common alliance”) lost all its undercarriage tires during landing at Maturin Airport. The picture comes from the aftermath of the accident, that forced to temporarily shut down the airport. While the rest of the airlines have to survive with their ageing fleet, State carrier Conviasa will get six new Brazilian aircrafts. Part of the Mercosur entrance blood-money deal, I guess. Still, Conviasa has its own problems of its own problems to deal with.